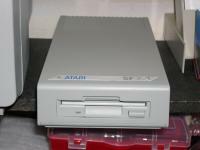 Perfect Atari ST/XE color match! Well as many of you know I got a MEGA STE off ebay that was All screwed up. Well I was looking at the case and notices it was painted when got it(from the factory) it was not molded like the 1040ST. Well after months of seaching I found the perfect color match to the comptuer. I went to a local hobby shop and picked up a can of TESTORS Light Sea Gray Paint Number 1926 or Part Number FS 36307. PERFECT match. I test painted a old sun yellowed 1040 today, and the Color is perfect. I hope this helps out anyone who needs it. Like I said its a perfect match not a "Oh its close". I will be refinishing my Mega Ste in the next few days, and will post pics. There's also Testors Flat Light Aircraft Grey, which is what I use. 1) Of course, take apart the computer to spray it. Clean all surfaces thorougly. 2) Some recommend a light sanding (extra fine grit), but I haven't had any problems not doing this as long as the case is clean. 3) Use scotch tape to cover any label tags you don't want painted (like the 520 ST tag for instance). Don't worry about overlapping the edges. Just use an x-acto knife to trim away the excess tape by simply tracing around the label edges with it and peeling away the excess tape. 4) Lay the case pieces on paper towling (Bounty, etc.) or some other neutral type paper. Do not use newspaper, sometimes the ink from the newspaper bleeds in to the paint if in contact. 5) In a well ventilated area do a prime coat. This means with the can 12" away, spray across the whole case from one end to the other in one even coat - NOT worrying about if you can still see through the paint to the case. The biggest mistake you can make is to try and apply to much paint at once, which causes bubbling or raised and uneven paint area (i.e. the paint runs). You just want to get this coat on to have something for the next coat to stick to evenly. 6) Wait 15 or so minutes, then apply the regular coat. Again, the can says 12" away for a reason. Any closer and your paint starts to gather and produce the previous mentioned problems. The regular coat should be applied like before, nice even constant spray starting at one end and going to the other at a patient pace. 7) Let dry for 12 - 24 hours before applying any touchup coats if needed. Spray with Testors Flat Lacquer Overcoat to protect the paint. 9) Again, let dry a good 12 or so hours, and then peel off the tape from the protected labels. If you have to, use the x-acto to start the peeling process. 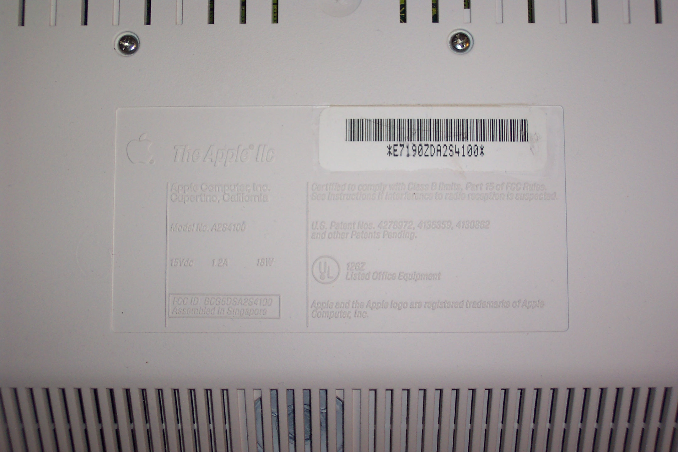 In this example, I covered the serial number label with scotch tape. 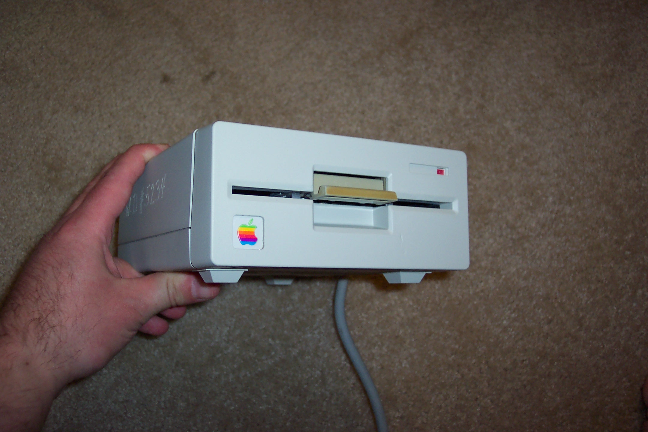 In the case of the floppy drive, I covered the Apple logo with scotch tape as well. Used the x-acto to clean up the edges of the tape as mentioned previously, so only the desired area was protected from the paint. Edited by wgungfu, Wed May 9, 2007 10:46 PM. Stuff looks very good, especially that //C case repainting.... next big question - what do we do about your hairy knuckles? Looks great I will post the pics here when I get it all together. Only thing I was luck on on my MEGA st is that the person never took the plastic covering off the front emblem that says MEGA STE. I removed all my emblems with a hair dryer, and pushed the led light covers out by hand. I cannot complain about mine. I got it free thanks to a e-bay scammer. He posted it in perfect condition ,even posted fake pics. Then would not respond to my e-mails when I ended up getting, a broken non working MEGA ste, that was rusted inside, broken case, yellow, and dirty. So after about $100 investment. I got a complete working unit. Only thing wrong with it is yellow keys. I've read that whitening toothpaste can sometimes cleanup yellowed plastic. It might be a good idea to test it on something else first, just in case there's an unexpected reaction, like all day minty freshness Was the computer case originally painted or made from coloured plastic? I've read that whitening toothpaste can sometimes cleanup yellowed plastic. No, that's just an old wives tale. When plastic yellows, its not a build up that can be removed, scraped off, or bleached out. Its a chemical process that happens as plastic ages. next big question - what do we do about your hairy knuckles? How about imagine what they look like bearing down on you to impart a world-o-hurt? I wondered if there was any truth in it. I suppose that some tooth whitening toothpastes might have a bleaching effect? I dont think it has anything to do with any bleaching effect, bleach dosn't get rid of the yellowing it just probably gets the grime out of the textured surface. Edited by mimo, Fri May 11, 2007 3:17 AM. Since it's "Testors" I presume it's model paint in quite small cans? Do you know if it is chemically designed to adhere to plastic? What did you have to pay per can of what size? The best I've found to date is 1) base coat of Krylon Fusion "Satin Twilight" (gray) followed by topcoat of American Accents (Rust-Oleum) "Soldier Gray Satin". Both of these are in the $3 range for a 12 oz. can. The Krylon is a little too light for Atari, but it is there to improve bonding to the plastic. 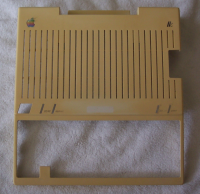 Incidently, your pics show Apple stuff, and my Apple items are slightly lighter in color than my Atari XE items. And WOW that is yellow! how closely do these brands really match the ST/XE? Do the functions keys look noticably different in comparison? that's where I notice my slight difference in colour. 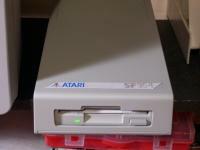 I've just restored a 1040ST using the same spray as I used on the XE's. It looks very good but being a perfectionist it's not a 100% correct match. Larry And WOW that is yellow! 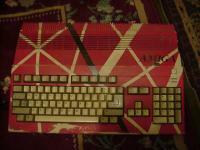 LOL yes, I can easily top that i think, I bought an original 520ST which is so yellow it's bordering on beige/brown! I'll have to post a photo of that I know they are getting on a bit in age but it'll look like the photo is aged in sepia tone! Edited by Tezz, Fri May 11, 2007 7:20 AM. Hi Larry, I think you meant to address it to me instead of sniperstorm. Yes, its the half size spray cans. Regarding plastics, yes, what did you think most model kits were made out of? They go for about $3 on up depending on where you buy it (I get mine at Michaels). As I mentioned, the Testors Flat Light Aircraft Grey has been a perfect match for my ST revamping. 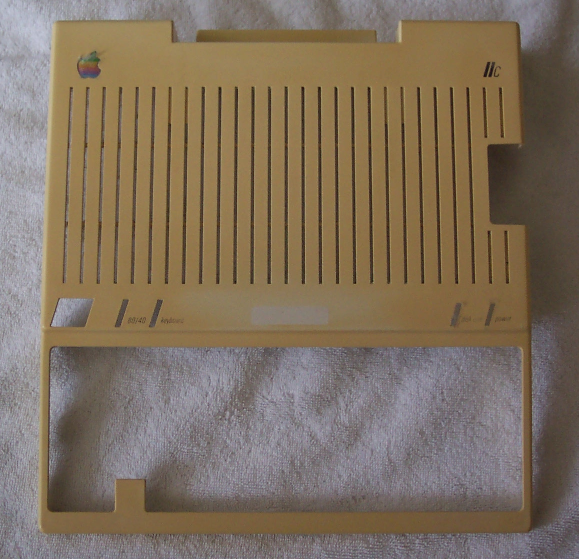 Incidently, your pics show Apple stuff, and my Apple items are slightly lighter in color than my Atari XE items. I'm not sure which Apple items you're comparing it to. 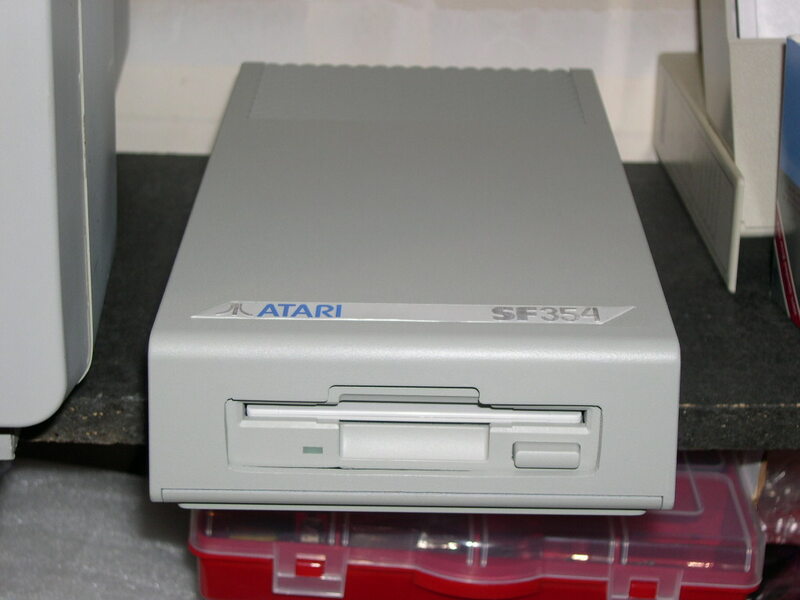 The drives of that mid era all use the same grey as the XE/ST - I actually held a stock XEGS up to a stock drive and it was an exact match. Apple had 2 different "greys" on their products over the Apple // years, a beige-grey and the "light grey" which is the same as the XE/ST. It just looks lighter in my picture for some reason. Likewise, the //c itself is white as were a number of products in this era, and is part of what is termed Snow White as a product grouping. Testors Flat White is a perfect match to this as I mentioned. Also - the only issue I've had (which is also the issue with ST function keys) is of course when there's text printed right on the case. You obviously can't "save" that like you can with a badge or recessed logo. The solution I came up with is to find the same font and print out laser printed clear decals that are exact matches. And WOW that is yellow! Yah, it was from some school in California. Well used apparently. The bottom of the case that I showed reconditioned in my previous post was just as yellow. Edited by wgungfu, Sun May 13, 2007 10:07 AM. Mine (as stated I used a different color than you), was an exact match. When trying different paints to match color, always try a test spray in a small area for matching before you spray the whole thing. Here is a SF354 I modded with a 720K mech. It was also very yellow, so I decided to paint it with Testors Light Sea Gray. Turned out nice! A few things I would add..
First, if the surface is NOT textured, then a good light sanding will greatly increase paint adhesion, but you want to use something like 800 grit or higher so as not to cause sand-scratches that will show through the paint. Don't bother to sand a textured surface because it wont do any good. Second, if you want maximum paint adhesion (and durability) you want the surfaces absolulutely clean. Wear rubber gloves(even the natural oil from your hands is detrimental to paint adhesion), and clean the surfaces with alchohol, then allow to thoroughly dry before spraying the primer. Do this step AFTER you have finished masking off everything that you DON'T want painted. third, allow several days for the paint to cure before touching it. Why do we care about durability, you ask? Well, I assume you actually intend on USING this machine.. and your hands will wear the paint off over time. Not to mention CLEANING the machine. I have never seen a "spray can" paint that commonly available cleaning solvents wouldnt completely remove. For instance, denatured alchohol, laquer thinner, acrysol, mineral spirits, or just about any petroleum based solvent will take Krylon™ completely off. None of these even PHASE automotive enamel. in fact, they are routinely used to clean the surface of cars during minor refinishing operations where it is not desirable to effect the surrounding finish. Comparing Chemically hardened paint to "spray can" paint is like comparing glass to soft plastic. Edited by MEtalGuy66, Wed Sep 26, 2007 7:03 PM. Edited by MEtalGuy66, Wed Sep 26, 2007 7:05 PM. Why do we care about durability, you ask? Well, I assume you actually intend on USING this machine.. and your hands will wear the paint off over time. Not to mention CLEANING the machine. I have never seen a "spray can" paint that commonly available cleaning solvents wouldnt completely remove. For instance, denatured alchohol, laquer thinner, acrysol, mineral spirits, or just about any petroleum based solvent will take Krylon completely off. None of these even PHASE automotive enamel. in fact, they are routinely used to clean the surface of cars during minor refinishing operations where it is not desirable to effect the surrounding finish. Comparing Chemically hardened paint to "spray can" paint is like comparing glass to soft plastic. Wouldn't the clearcoat make the paint too shiny? Wouldn't it look different compared to the stock XE texture/color? I will have to try it and see how it turns out. Edited by tjlazer, Tue Sep 25, 2007 10:09 PM. Who said anything about clear coat? Why in the HELL would you clear it? Edited by Beetle, Wed Sep 26, 2007 5:31 PM. Sorry I must of mis-read it, I thought you said Clear Coat, you said Base Coat. MY BAD! I also tried a different shade, called Flat Light Aircraft Gray from Testors and it is too light. (looks like TT030 shade) Light Sea Gray seems to be pretty darn close. I also got a Flat Gull Gray can to try and see how it looks. Edited by tjlazah, Wed Sep 26, 2007 5:42 PM. 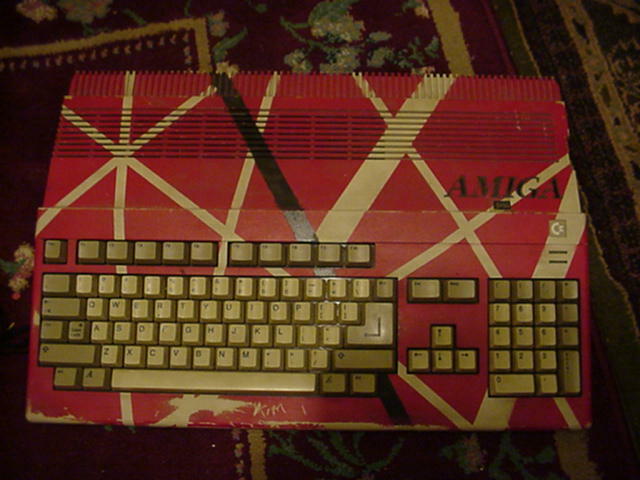 This is My friend's "Eddie Van Halen Signature Series" A500 that he painted back in about 1989..
Notice the area where you rpalms rest when typing.. This was done with Spray-can paint. If you are going to paint a machine, unless your never going to use it, your better off leaving it alone, then using paint from a spray can. If they ever figure out how to make a 2-part chemically activated spray can, where it mixes activator and base as it sprays, then that might be ok.
Well I doubt back in 1989 they had special spray paint for plastics, and even if they did, did your friend use this type? I doubt it.